I think you'd be far better off getting any car that you're seriously considering (i.e are already 95% sure of) professionally checked out. ...I am afraid that comparing engine sounds will not help you...it could sound and drive perfectly ok until it fails...ask me how I know! Mine was perfect for 1000 miles and then the stud snapped off the ims...now being completely rebuilt! Get the bearing changed on purchase or buy one with this work done would be my advice unless you enjoy a £10k gamble? It doesnt happen very often these days .. but as mentioned it can , my advise is always if your worryed about it then replace it . Re a noise .. you dont really get one .. Example .. a collegue of mine at OPC took a car on road test for a phone fault .. poor sound quality .. as he was speaking to the workshop foreman ( hands free ) the bearing let go . It was that quick and no prior warning . Thats the scary bit .. the reality .. ive not seen one of these go in over a year .. might be pushing 2 . But a different fault from what you stated. So your advice on having the IMS bearing replaced or buying one with a replacement bearing is duff information unless the stud is replaced with a more robust solution. Hartech son't offer that service. They will only replace a bearing during a rebuild..........unless when they do your clutch they find the bearing is about to go bang. Just have the outer seal removed from the bearing and leave it alone. Funny how Porsche's weak under spec'd bearing was perfectly fine in over 90% of all M96/M97 engines. if you want piece of mind, it would be a good idea to get Hartech to check the bearing when you have your clutch replaced. Alternatively, there are many well respected Indies who have replacement / upgrade bearing solutions which ought to give you the piece of mind you are looking for. It depends on the level of risk you are prepared to accept. As has been mentioned, there are no characteristic noises that indicate future or imminent failure. ...........and 'upgrades' also fail - ask Hartech. It would be interesting to know from Hartech which type are failures, who fitted them and how many failures occur. From what I have seen Baz does not say that people should not install IMS replacement / updgrades. Here is a respected Indie with zero replacement failures for example! It is possible to rubbish any statement with one liners and without the facts, as Baz advocates, people are free to fit replacements and some are good solutions. GMG may wish he had! It is what risk you are prepared to accept of an IMS bearing failing. If not make a brew and have a read. I have recently bought a 996 and read the internet and scared myself silly. I read that topic and spoke to a few people I feel I can trust on the matter and stopped being scared. I had the clutch, RMS, LTT, water pump, coils etc done before I picked up my car and had the IMS inspected. It was found to be fine. While they were looking they popped the seal out. I really believe that is the way forward and I am happy to drive my car for the next 5 years or what will probably be 30,000 miles. In 5 years time my car will then have ticked over 100,000 miles and the engine will most likely need a rebuild if I want to continue using it to it's full potential. Bearings etc will be worn like any other engine. At that time my Porsche fund will hopefully have built up enough to fund a Hartech rebuild and I will be ready for another 100,000 fun filled miles. Yes it will probably cost 12-15k and represent at least half the cars value even if prices rise as they have been doing. If they do or don't I will have a fresh engine in a brilliant car that still cost me a fraction of anything that offers similar performance and satisfaction. Until then I will use quality oil, change it regularly and warm the engine before I spank it. Oh and fix the lumbar support. ...I am inclined not to rely on statistics that I believe were used in some American court case or other many years ago to reinforce claims that ims bearing failures are rare and rely more on the apparent and practical realities...hartechs business pivots around failures of this engine and the 3 indies that I spoke with prior to buying mine plus the one now rebuilding my engine (which is third in the queue of ims failure) all were rebuilding broken ims related failures at significant expense and inconvenience! It is singularly and peculiarly unhelpful to repeatedly regurgitate those meaningless statistics as it is no help at all to potential purchasers with related questions...It might make you feel better Alex but aside from that adds little of value? I couldn't care less what others choose to do but I would ,if asked, only ever advise that if one is concerned one should take action sooner rather than later...the last thing I would advise is not to worry! 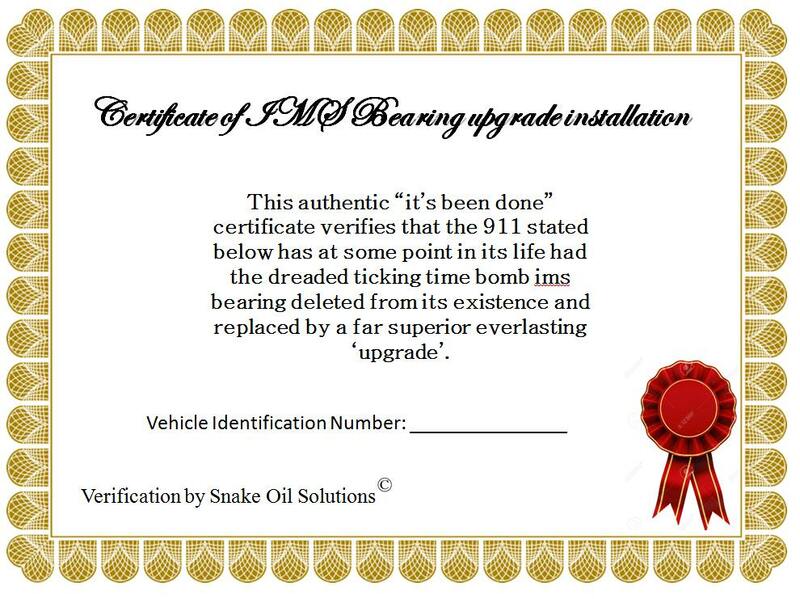 If anyone wants their IMS replacing, I will gladly take £1000 off you for doing it and it will come with a cast iron Guarantee that, if in your ownership, the bearing fails, I will buy you a brand new 991.
my car i a 99 3.4 which has the dual row bearing now clocking on 100k the rms is leaking so in the winter i am thinking of changing it, if the ims looks dodgy what could i replace it with? as the dual bearings are no longer available.